Last year was my 1st year with SBG, thanks mostly to Don Pata. I certainly did keep it as simple as I could, since I was working solo for the most part. This year I’m venturing out. -Fewer standards per unit. Your point of using 5 seems like a good target. I occasionally wandered close to 10 and it made everything chaotic. -Some sort of mandatory reassessment. I don’t feel comfortable spending class time on retakes (I want students to learn the importance of self motivation). Not sure what it will look like yet, but I’m thinking of dropping proficiency scores down to 1 (the lowest) if students who scores below a threshold don’t reassess. -A base unit of 4-5 standards based on classroom expectations (coming to class prepared, cleaning up, participating in discussion, etc). I’ve tried not grading HW for years and students never seem to grasp the importance of preparation until it’s way too late. My only gripe about your post is the binary system. How many students will shut down completely if they’re told they can’t do something on the first try? At least with a 4 point scale, the message is more about progress and growth. Yeah, it’s a little harder to manage, but I think it’s better aligned withe the goals of SBG. In regards to your concern, about students shutting down, I try to sell the “No” as a “Not yet”. I start with what (s)he did well, say what they need to fix, and make a suggestion for how to get there. In the first week of my earth science class this year, my time has been mostly spent visiting with students (rather hurriedly) to discuss their assignments. I have a spreadsheet (on my iPad) where I mark off completion or interim progress on these assignments. The plan is then to translate completion of assignments into binary success with vaguely correlated standards (in BlueHarvest). I love the “not yet” message-that’s real life-it supports the idea that learning is a process…the 4 minute mile wasn’t Y/N…but “not yet” for a long time…a worthwhile goal that stays in front of the student and motivates the hard work to succeed in the future. Absolutely, but it seems like you’re grading informally with a non-binary scale and then switching over for formal reporting. Why switch? If it’s a “not yet” as opposed to a “not at all”, why not just input that? You’re right, Barry. I think I still will enter the “not yet” in BlueHarvest, but it will be better because the comment will mean, “You’ve not yet met this standard, instead of: “I don’t think you did this assignment well enough.” I’m hoping that will be clearer to the students, less tedious for me, and helping me and the students focus more on learning than assignment completion. Thanks! I love the Not Yet! I’m toying with the idea of assessing classroom expectations, too. In that case, I would make the physics content standards worth 50% of the grade, while the expectations would be the other 50% (effectively, the 50 points they would have automatically gotten in my 50+50*(#/N) system for content only). The extra 50 is not so much a “grade booster” as it is a grade equalizer: gives each grade A-F an equal interval of 10 percentage points. To get a D, you need to get more than 20% yeses, C more than 40%, etc. As Frank mentioned, it makes it easy for students to figure out their grade if they are accustomed to the traditional grading % scale. If a student got all y’s, it would be 50*(1), which is 50, +50, which would be 100. I agree with what other folks have said about the 50 points. It’s an equalizer, not a booster. Yes, sometimes I have multiple questions per standard. There’s not fixed percentage they have to get correct to get proficient on the standard. In the end, you use those questions as evidence to the question, “Does this student meet this standard?” In terms of how many quizzes in a semester, I aimed for having each standard assessed in class twice. If a standard was only assessed once by quarter’s end, I didn’t count it in the current quarter and carried it over to the next. Thanks Frank. I’m taking a really small baby step this semester and only calculating the students quiz average based on standards. I decided on a 2 point system; 0 if none of the questions on a standard are answered correctly, 1 if some are answered correctly, And two if all are answered correctly. I will still have a potion of their grades from homework/labs, participation, and tests. Thanks for the response. It really helped. After reading the recent posts. I think the 2 point scale will now be not yet, almost, and yes. I liked your idea about expectations making up the other 50 points. Teaching lower level students, most of the time if there aren’t points associated with it they won’t do it. Thanks again. I appreciate the support. Thanks for the helpful hints! I plan to take baby steps into SBG this year. I will probably do this with my one section of Honors Physics and transition all my classes next year, after I work out some of the kinks. I have one of the same questions that Penny raised. How many questions do you have per standard on a quiz/test? How many must students get correct to meet the standard? Thanks! It depends. For a standard about interpreting motion graphs, I might have a graph with several questions. Maybe I’ll some easy, medium, and hard questions. Perhaps if students miss just the hard question (b/c I was expecting most to miss it, but see who could stretch their brains a bit) I would let them be proficient on the standard. But if a student misses a question that I feel indicates true understanding, than even if they miss just that one question would not allow them to be proficient. Thanks, that makes sense to me too, but I’m still stuck in an A/B/C/D/E world. In the end, I decided to go with a four-mark scale, rather than Yes/NotYet. I chose the marks from Illinois’ standardized tests: Warning, Below, Meets, Exceeds. In my district gradebook, I assigned the following percentages to these marks: Warning = 50%, Below = 60%, Meets = 80%, Exceeds = 100%. Using your example about interpreting motion graphs, students who miss just the hard question Meet the standard, and students who get all the questions correct, Exceed the standard. Overall, students who Meet the standards will earn a B in my district’s grade scheme (B = 80 – 90%), and those who Exceed the standards most of the time will earn an A. New thought: what about math? In my current grading scheme, I often give partial credit on problems because students set them up correctly but screw up the algebra before the final answer. In your SBG scheme, does this count as “did not meet standard” or are math skills a separate standard? That’s where I see the advantage of using a 4 point scale instead of a binary one. 4 = expert, 3 = proficient, 2 = partially proficient, 1 = no evidence of mastery. A simple algebra mistake with the concepts clearly mastered is a 3. I’ve seen it done both ways. Some folks have a separate standard(s) for algebra/math/units, while others include it with the content standards. Go with what feels comfortable for you and your student population. As a relatively new teacher-I love this post as a solid place to start implementing SBG that is doable while I am also trying to increase my inquiry/model based learning, continue improving the efficiency of my processes for administrivia, etc. The only concern I need to continue mulling over: If a student is “done” with a standard once they pass it once (vs-they demonstrate mastery of, for example 80% over 5 questions total), then don’t these example standards actually VERY big sets of competencies? Specific example: “2.4 I can draw and interpret graphs of heating/cooling.” For a student to demonstrate mastery of this standard, they are synthesizing many pieces of information-the structure of the graph and the data it represents, the vocabulary of phase change, kinetic vs. potential energy, …etc. I think I would need to see the structure of the assessment question to know if I am comfortable with one “yes” = standard mastery demonstrated. This post, nevertheless, will absolutely give me a rationale and sustainable way to begin implementing SBG with my students, and for that I am VERY thankful. You have a mathemeticians gift for communicating the power of “keep it simple.” Thanks! Thanks for both the suggestions on how to simplify SBG and the reminder that not all changes need to be implemented perfectly! I’m teaching a new Physics course about models of light, and have been having a hard time deciding how to assess students. I might just have to throw my rubric out the window and go with this system of SBG. Simple, yet seemingly effective. I also agree with the discussions on Yes/No. I think I may view it as Yes/Not Yet, or maybe even “Goal Met/Work to Meet Goal.” Maybe then, student who have never been assessed this way will see that they are not failing a standard, but understand that they still have time to work towards and meet the goal. I may also drop this in Chemistry as well, where I model. Thanks for another great post. Good luck, Terry! Keep us posted! I’m diving into SBG for the first time and grading the standards in the binary fashion. My question is why is term grade 50+50(Y/T), instead of just (#Y/#Total)? Besides the latter being much simpler, doesn’t it infuse the grade with more meaning. If I master 15/20 standards, I understand 75% of course material. If I understand 75% of the course material, why should I get a 87.5% (As under the first method)? Or is this more just about where we set the bar for our students to get an A? This system makes the lowest grade a 50. This equalizes the 0-100 point system to be consistent with the ABCDF/4.0 system. Also, there are fewer standards in an SBG system compared to points in a point system. So this makes not mastering a standard (akin to getting a zero) not wreck a student’s grade. Does it seem sufficient that a student could master only 20% of the course material and still get a D? That seems like an awfully low bar to me. Being my first semester trying the binary grading scheme, I don’t have much experience with students’ final grades, but ideally wouldn’t we want student to gain an A by mastering 90% of the standards? To me that seems the simplest, most rigorous, and infuses the grade with the most meaning. It seems to me the trick then is just figuring out the appropriate amount of standards per semester. I know Shawn Cornally simply takes #Mastered/#Standards*100 for the grade. I love the idea of keeping it simple! Either they get the full points or nothing. It makes it easier with grading. For me, keeping it simple actually meant expanding the point range for each standard to 0-100 pts. I grade each standard holistically (no point values for problems) and assign a grade for the standard based on my perception of their mastery of the concept. I’ve found a lot less confusion about how their current grade in the class ties to their performance on tests. I also like the additional flexibility that I have for grading – when it came down to it I really felt uncomfortable using a binary system when I have many students who seldom take retests. Hey Frank, I’m very glad that you’re NOT a purist – purists are boring! I very much agree that if streamlining the SBG process gets more people on board, it’s worth it. If teachers continue to engage in a discussion about what the purpose of grading ought to be, they will adapt the system over time to become more effective. But just putting the idea in teachers’ heads that traditional grading systems can and should be questioned is a major achievement in itself – thanks for putting the idea in mine! A fascinating conversation. I’ve taught English for a while now, and I still can’t seem to figure out SBG. I like the approach of Yes/Not Yet. But I worry about (1) English’s standards being really broad and therefore hard to pinpoint, (2) Students meeting none of the standards because of their longstanding struggles with reading and writing, (3) Where habits of work / work completion / “character” come into grading (though SBG purists will say it doesn’t come in! ), (4) How to calculate the final grade. I prefer simplicity on final grade (#met/#total). But this assumes that each standard is of equal weight, right? I want my students to learn MLA style, but I think using evidence to back up their claims is more important. This is where a point system (within SBG) might be a good idea. If you have thoughts about any of this, I would be very appreciative, and thank you for reading my comment. Hello! I second the motion / question on the 50 + 50*Yes/Total formula. We like SGB alright, but we are still finding a way of executing it in a percentage-driven society. Keep it simple is a nice mantra to try to live by. But the reality is that life is not simple. One way to make it simple could be: “I’m the teacher and in my fair assessment of your child, your child is not meeting standards.” And the student and his parents just humbly asks, “What can we do now?” instead of arguing with me. 🙂 See? Life is not that simple. Good stuff to think through. I’ve jumped into SBG this year and find it refreshing, frustrating and amazingly rewarding. When students found out they were being assessed on what they know, not on their effort or attendance or any of a dozen things they are used to seeing on course syllabi, they were pretty leery. Now I think when they realize that 1 is not close, 2 is closer and 3 is getting there (or there for some). It was cool when they did work and got back a “3” on the first shot…..even more cool when a classmate got a “4” and students were clambering to see what that looked like. This has been a good, thoughtful journey. If students grades can’t go down after meeting a standard, does a final exam no longer have any place here? How do we ensure that students don’t just cram for a test, only to forget the next day. In math, the cumulative knowledge is essential to success in future classes. (Hence my room full of calculus students in an SBG system who don’t remember their unit circle, let alone any other trig, and lack basic algebra skills. Many are failing and many dropped the class.) Also, I’m having trouble pigeon-holing questions into standards, as many questions require a combination of skills. Another issue I have with SBG is managing the reassessments. I teach three sections of generally low-performing students in Geometry. (They are predominantly upperclassmen who have failed at least once before.) Nearly all of them need to retake the tests. If I have to reteach them, cajole them into coming into retake, contact their parents if they don’t, I’ll be working daily until the cows come home. I like the idea of embedding previously failed standards on subsequent tests. Do you tell the students which standards you’ll be reassessing on a given test? I have yet to make the jump to SBG but am transitioning this year, so to speak. I do have a major concern I was hoping Frank or others could address. I work for KIPP and they are pushing the ideas Paul Tough wrote about in his latest book. I read it and Tough writes that GPA is a good indicator of success in college because even at low performing schools, a high GPA shows that student is turning in assignments, preparing for exams and in general, showing the academic habits and intellectual skills a student needs to be successful. GPA is mostly based on a points-based grading system and if students don’t turn something in, they get the dreaded zero. So my concern is, if I switch to SBG, how will I account for the skills and habits students should develop to be ready for college. I read earlier posts that talk about using the extra “plus 50” for that type of grading. But I am interested to hear more about how to reconcile the use of SBG with developing good habits and skills that students need for college. I have lots of students that will “show mastery” of concepts despite the fact that did little to no homework, did not turn in other formative assignments that require work outside of class, and most times needed a re-test or a re-take to show that mastery. I fear that using SBG will allow those students to matriculate when they are not ready. What to do? I have a lot to comment on and I tried to keep my thoughts organized, but typing this late at night on the last day before Christmas Break might not have been the best choice, but whatever! SBG implementation at my school was piloted for core classes for freshmen in 2011 and is mandatory for all 9th and 10th grade classes this year (2012). It goes mandatory for every course in the high school in 2013, (except AP courses, thank God!) Here’s my take on things. First of all, I use the term “kid” because it’s faster to type than student. I’m not trying to demean them. Second, I’ve taught chemistry for 22 years. Anyway, my first reaction to SBG was “why”? Is it better than the traditional system? What are you saying to me? Are you telling me that I’ve been giving too many A’s or too many F’s or what? What is wrong about the traditional 90, 80, 70, 60 system? Well, we were told that we were not assessing what the kids “know”, but instead, we were giving kids grades based on what they did—homework (HW) shouldn’t be for a grade since it’s just practice for the test. Fine. I can understand that. You shouldn’t give extra credit for bringing in Kleenex or because you did a word-search. Fine. I agree. Retakes should be allowed. Fine, but can we at least limit the # of re-takes to just one or limit the maximum grade on the second attempt to a B or something? We were told, “No. Everyone should be allowed to re-take a summative assessment as often as they like and be able to get a score of a “4” (A+).” Really? Is this preparing them for the real world or college? And when am I supposed to find the time to make 3 or more valid tests over the same material? Really? Oh, and you can’t take off for late work. Really? So there are no deadlines in real life? Really? Anyway, what looks good on paper sometimes doesn’t match the realities of the classroom. We were also told that the traditional system of 90% = A- , etc. was too arbitrary. Well, we now have to use a 4 point scale that much more arbitrary in my opinion since the choices I have for what grade a kid gets on a test has gone from 100 possibilities down to 4. (Actually, the district allows us to give scores of 3.5, 2.5, 1.5 and 0.5, so it’s really an 8 point system.) If you are telling me that there’s little difference between a student who knows 90% (A-) and 89% (B+), I’d agree with you. Both kids “meet the standard” but every system has to have a cut-off from one score to another so this topic of discussion is moot. But now I have to decide on whether I give a 3 or a 3.5. Also, since colleges won’t understand what this SBG grade is, our school has to translate the SBG score back into a traditional letter, so even though they tried to avoid the traditional system ends up being a traditional letter grade in the end. I don’t know why we can’t cut out the middle man and just use the traditional letters to begin with. So a score of 3 = 84% (B) and a 3.5 = 94% (A). Well this 10% gap in terms of what a student knows is much bigger than you’d think. There’s a big difference between a 79% student and the 89% student, but with the SBG grading system, both students would get a “3”. I want to be able to differentiate the 90% student from the 85% student from the 80% student, etc, and it is much harder to do using SBG. And I also think that SBG is too “touchy-feely”. What I mean by that is that when I grade I say to myself, “I think this is a 3”, or “I think this is a 2.5.” Back in the good old days, I could count up points on a test, divide, get a % and move on with my day. Test creation was fast and simple: easy questions were worth less than hard questions. I could spend my time developing exciting labs or demos or on-line activities or improve my notes or make better w.s. Now I spend time making rubrics, re-writing tests and quizzes to fit into a new SBG system, thinking of stuff like, “what makes a 4 different than a 3 or different that a 2.5?” SBG has caused me to spend an inordinate amount of time on how to go about evaluating the student rather than how to go about teaching the student in the first place. The focus of SBG has moved away from student learning to teacher test writing and test grading. I could argue that my traditional way of grading was valid in the first place, so student learning has not improved with SBG. It’s not like I just graded based on the color of ink on the page: blue = A, black = B, pencil = C. The reality is, that with the traditional system, my smart kids got A’s and average kids got C’s and not-so-smart kids got D’s or F’s. Now my smart kids get 3.5’s, my average kids get 2.5’s and my not-so-smart kids get 2.0’s or 1’s. (FYI 1.87 has been deemed “passing”. Again, this is an arbitrary value as well.) It’s really no different than before. Nothing has changed in terms of grade distribution because there was nothing wrong with the way I was grading before. The way I grade in SBG is valid as well. But SBG is again, it’s so much more time consuming to grade, and I can’t distinguish the performance of one student to another as much as before. Another issue I have had to deal with because of SBG is that our grading program we use, Easy Grade Pro, makes all summative scores count the same weight. So a short quiz over something simple and straight-forward like balancing chemical equations counts the same as a 2-day laboratory that has a typed lab report or a chapter test over stoichiometry. It has limited what assessments I consider giving since everything counts as the same weight. I shouldn’t have to resort to manipulating the grading program to make sure the student is getting the grade they deserve, but we are shoehorned into a system with too little flexibility. Now the biggest issue that has come up because of SBG is homework, or lack thereof. Now let me start by saying that my HW grades used to only count for about 5% -10% of the overall grade, and the only reason I made it worth anything at all was that the kids I teach aren’t self-motivated enough (nor would I have been motivated enough when I was in H.S.) to do something that “doesn’t count for anything”. Needless to say, this has been the WORST year ever in terms of kids doing HW. And this includes my junior-level traditional grading class as well!! This is as school-wide problem across all disciplines. It is ubiquitous. SBG doesn’t count HW as a grade, so kids don’t do their HW. It’s the #1 complaint by teachers. The kids say, “Why should I do my HW? It’s not for a grade.” Low achieving students do not understand that a lack of practice = worse test grades. High achievers still mostly do their HW, but even they will admit, they don’t practice as much compared to if it was for some sort of grade. They only hear, “it’s not a grade” which means, “I don’t have to do it.” Then I get a bunch of bad grades on the test, and we all know why they are worse than usual: they never practiced it enough in the first place. If I could just have the freedom to give a little bit of credit for HW, then my kids would do it, but then this “credit” counts as much as a test and I’ve already talked about that issue. Another thing I need to say about SBG that no one though about is that teachers and students and parents struggle with understanding how a grade is calculated. Now I’m capable of understanding how the grade is averaged based on the learning standards and performance indicators and all that jazz, but before, I could look at a kid’s overall average and estimate how an assignment would affect their grade. If they did better than their present average, the grade would go up. If not, the grade would go down. Today, it’s anybody’s guess to what’s going to happen. I don’t even attempt to tell them anymore what their grade is going to be if they were to get, for example, a “B” on the next test. Even worse is this…When you get to another learning standard, one individual assessment counts as a huge % of their overall grade. For example, in November, we started a new learning standard on chemical reactions. It was the 5th learning standard of the year, so the very first assessment I gave was a quiz over one topic in the unit, and that one assessment counted as one-fifth of their grade. The averages were rising and dropping entire letter grades IN NOVEMBER base on one small quiz. I understood what was happening and that it would eventually work itself out in the end, but try to explain that to a parent who just saw their kid’s grade go from a B to a C in one day because of one relatively small assessment. It is said that SBG allows a kid to understand what they know and don’t know better than the traditional system. I disagree. I can go through any test that I have given a student, and I can explain why they got the score they got. I can justify everything I grade and why I grade the way I do. I know what questions are basic knowledge, which are conceptual, which involve math skills, and which involve higher levels of critical thinking skills. (Of course, a vast majority of kids just want to know what letter grade they got, but anyway…) You simply don’t need SBG to effectively and fairly evaluate student learning. I think that many districts are going to SBG because they have to change something in order to show the “powers-that-be” that they are trying to improve student learning. SBG seems to be the shiny new toy for administrators or non-traditional teachers to play with. Simply put, SBG, in my opinion, does not improve student learning because SBG is not focused on learning. SBG focuses on evaluation, and I already know how to evaluate student learning. “New” is not always equal to “better”. “New” is sometimes just new. And I haven’t even mentioned the money our district spent on teacher training!! Anyway, just be aware of the unintended consequences of using SBG. And don’t get me wrong. If you are a teacher and you want to give it a try, and you have nothing else better to do with your time and energy, you go for it. I’ll think you are crazy, but I’m not stopping you. This is my own experience and my own opinion, but it is not one that is out of the ordinary in our district. Finally, if there’s an administration out there reading this post who is thinking about going to the SBG system, be aware of the numerous pitfalls I have mentioned. Much of SBG is hyped, and the idea of HW not counting for a grade, or the use of re-takes, or other supposedly SBG-inspired ideas does not require the use of SBG and the “4, 3, 2, 1 Learning Standard” framework. Any of those concepts could be incorporated into the traditional 90, 80, 70, 60 grading system. And scene! Dan, to be honest, I did not read all of your comment. But I read enough to try this as a response: The one thing SBAR does way better than the traditional system is that it allows students to improve their grades if they can demonstrate they have learned the material. Why should a teacher care if a students learns a topic in the fourth week, so long as the student learns it? The traditional system majorly de-motivates students to improve because often times the early “zero” in the grade book makes all future efforts worthless. hi dan! you mentioned not AP, thank god in your note. did your hs ever go sbd on ap? if yes, can you tell me how it works? why did your hs NOT go sbg on AP? we are looking at this and i am struggling with the issue. We didn’t use SBG in the junior and senior classes since there was such a backlash from the implementation in the 9th and 10th grades. With that said, if they ever made me do SBG in my AP course, I’d use a traditional point system and convert the points to a 4, 3, 2, or 1 just like how the AP exam is graded with points and then converted into the scores of 5-1. Dan, I find your discussion and detailed analysis to be both cogent and encouraging. My district has experimented with various forms of SBG, working very diligently for years to lay the groundwork with “consensus” building and getting teachers to question all of their practices in grading. Typical of many pseudo-thinkers (especially those from the Church of Rick Wormeli, A.K.A. the SBG God), I noticed some of those who responded to your discussion did not read it in its entirety before jumping in. This is because their opinion is already formed, what does it matter what you have to say since (in their opinion) you are either ignorant, misguided, or outdated? What does it matter your practical experience in pointing out the flaws of SBG, since Rick Wormeli and the SBG crowd have it all figured out (or so they think). I don’t mind having an honest discussion about what works with traditional grading and what doesn’t. I think its great to borrow the best of both philosophies and create a rational outline of best practices. But what is very hard to stomach is the purists who insist that SBG is without flaw, and any trouble is simply the teacher’s mis-application and that there can be no room for “hybrid” systems etc. I also notice the SBG-fundamentalists tend to also create straw-man arguments to make their point. Cited on this page is the gentleman who said that getting a zero early-on skews their grade for the rest of the semester and destroys their hope and motivation (I paraphrase, of course). Well that is the very essence of a straw man argument because in my 16 years of teaching math such a circumstance has not occurred through primarily traditional grading. How often does a student receive an actual ZERO on an large point assessment/test? And if that was to happen in the most rare of cases wouldn’t most rational teachers find out why and present the student some options? A retest? An exemption? I certainly would… such an extreme case certainly does not warrant the whole-sale dismantling of all traditional grading practices and can be dealt with fairly through rational and traditional means. However, zero’s DO occur on homework at times, especially when not turned. Again there are ways to deal with that… including taking the work late up to some reasonable limit (as mentioned on this page, all limits and timelines are at some point arbitrary…. get over it, right?) There are many ways to rationally develop effective and meaningful traditional grading systems that are efficient for teachers and communicate accurately to parents and students. There are some concepts of SBG that are worth adapting, and many concepts of traditional grading that work too. As you said, if a teacher can find a way to make SBG work for them great. But for districts to whole-sale force all teachers into this rube-goldberg inspired grading apparatus known as SBG is foolish. I would be very pleased to hear an update how your systems are going and the district with grading etc. Thank you again for your well reasoned comments on this forum. Your thoughts may be scorned by some but are appreciated by many. J-Dub3– not much has changed since my last post. We use a hybrid grading system at the junior level that is partially SBG in terms of offering ONE retakes not a major assessment ( up to a 90% , A-) if the kid did their HW and test review practice problems, and HW is graded on a 3,2,1,0 points system…mostly based on completion. It is only about 5% of their final grade. We go by total points, not the 4,3,2,1 system. The soph and freshman levels are still SBG and teachers have added a HW standard to keep kids accountable for homework, This standard is about 5-10% of their grade. The drawbacks of full blown SBG are still being dealt with. The district is also adding SBG at the middle schools. Grades and test scores have not improved with the new grading system…imagine that! So it’s not solved any of the so called problems that we apparently had with traditional grading. The best thing to come out of SBG is not having to grade HW in the time consuming detail that we used to do! It must be such a delight to be in your classroom. For really smart kids. Everyone else seems to be getting the message that they are too dumb to master anything and that they might as well just give up. You could still be challenging the bright students and allowing the others to learn as much as possible with a more flexible grading system that allows those who are ready for topics #4,5 and 6 access to them while still keeping your commitment to teach those who aren’t ready yet. Only teaching the brightest kids in the room seems like a cop-out. Dave, when I see someone use the phrase, “truly develop understanding of the concepts being taught”, what I hear is a bunch of edubable. If you can get an A in my class, you have demonstrated TRUE understanding. Maybe someone else’s class, this is not true, but you can’t assume that it is the case in my class. It is not easy to get an A in my class. So if you get one, you have exceeded the standards no matter how you define what the standards are. As for your comment on our ineffective hybrid, I would agree with you that it is a hybrid and it is ineffective and that’s why I am no longer frustrated since I am back to the tried and true points system that had been working for so many students for such a long time. Yes, SBG may work better for some students in some classes, but forcing it on every student in every subject doesn’t seem right. If you find it works for you, great. Use it. More power to you. But I found that it doesn’t work for my classes and my students, so I am glad I don’t have to use it and I don’t hear the students (or parents) begging me to use SBG. As for your comment about the smart kids in my classes being delighted and everyone getting the message that they are dumb and should give up, I’d say that the kids that don’t get A’s or B’s are gong to have to get used to the fact that they aren’t as strong in this class as others, and you know what? That’s still OK. In fact, I tell the kids a story about how my brother got D’s in science, but he went on to become a science teacher. Why? Because he liked science even though it was a struggle for him. I tell them up front on the first day of class that don’t care if they get an A or a D as long as they are trying their best. That’s what counts. I give re-takes on all of my tests and quizzes, so I am giving the slower kids a chance to master the material but some could spend another month on a topic and never master it. That’s just reality. When I was a rookie teacher, I thought if not all kids mastered the material, I should give them more practice and more re-teaching of the topic. I gave another assessment and I leaned pretty quickly that sometimes, there are limits to what a student can master given the reality of a time limit determined by the length of the school year. And that’s still OK. This idea that everyone should be given time to get an A just doesn’t fit into the reality of a high school science curriculum. But I’d rather have a student get 70% of the knowledge over 10 topics rather than spending all of their time trying to master 3 topics. I will reiterate that if SBG works for you, and if the students like it better than a points system, then use it, but I feel that what I have been using has worked for an overwhelming majority of my students. And if it ain’t broke, I don’t know why I am being told to fix it. It’s me Jamie Barbour again. I’m one of Dr. Strange’s EDM310 students at the University of South Alabama. I really enjoyed reading your version of Standard Based Grading. I like the idea of “Keeping It Simple” and the techniques you talked about in this post are ones I will definitely keep in mind for my classroom. I really like when teachers give back tests or quizzes with a score sheet and grade report. I like to know what I missed and where I stand in my classes. Thanks for the post. Love the post. I am thinking of “banning” reassessments this year in 3 sections of my classes. They will be quizzed on each skill twice in class. Technically, that 2nd time should be viewed as a reassessment in my view. The end of the quarter always ended up to be a legistical nightmare with students waiting until the last possible moment to bring their grade up. This happened even with a “reassessment application” and limiting students to one reassesssment per week. I am feeling somewhat guilty about this as “traditional” SBG allows for unlimited reassessment. I like your idea of tossing a skill on an in class quiz but I feel students would have trouble finishing the current skills on the quiz. Again, great post. I love the KISS approach. I needed to hear the ‘don’t let perfect be the enemy of good’. We are modifying our physical science classes this year, I am pushing the envelope and taking baby steps towards SBG. Your ice-skating checklist I saved to show my department. 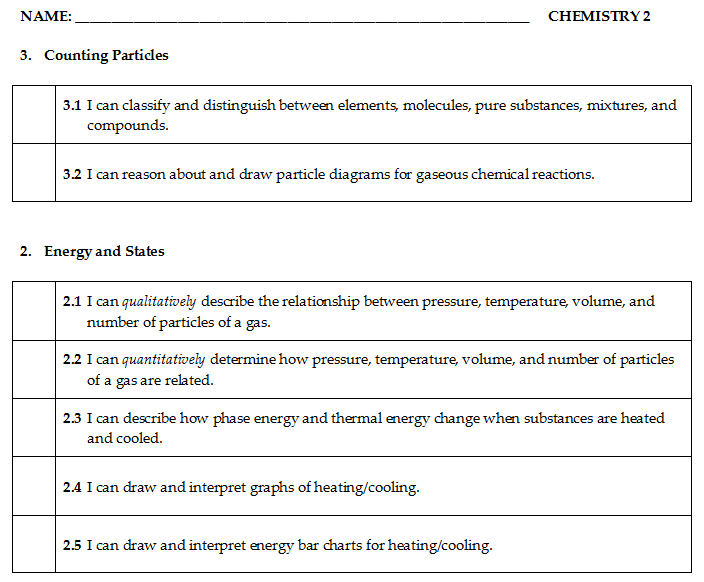 Would you mind sharing how you divided up your chemistry standards in ‘I can’ statements? The semester grade is determined by number of standards met- less then 50% met and the student fails the class. Under no other system has a student to have 50% A and B just for a passing grade. This system discourages students from learning, when the question in the past was more knowledge but a “C” in a harder class, or less learning and a “B” or even “A” in an easier one, it now actually is “do I want more knowledge and risk an “F”? The stress this puts on parents and students is unbelievable. High performers do well, average students usually drop a grade, or two. Family life starts to revolt around math and grades, resources are scrambled together for tutoring. I always liked math and encouraged my kids to do the same. SBG first and foremost resulted in a deep hatred of this subject and longing for the end of high school to be done with it once and for all. This is not how education is supposed to work. I understand your frustration, fanniemae357, but beg to differ with your conclusion. In my opinion, this IS the way education is supposed to work. Your child is now being asked to truly develop understanding of the concepts being taught, rather than being rewarded for doing school tasks, like homework and projects. This is hard to get used to and will likely result in more time and resources spent on learning. This is not necessarily a bad thing. Update: So our principal listened to the opponents of SBG relating to its implementation to every class, so it is still only in the 9th and 10th grades, and since I am teaching only 11th and 12th graders this year, I have a break from dealing directly with SBG at least for another semester. But I wanted to give an update on SBG in our building. (1) All assessments are still worth the same weight. This is still a BIG problem. Tests still count as much as a quiz. (2) Homework is now a standard although it is weighted less than other standards (10% or less). This is to keep kids from totally blowing off the HW. (3) Last year, if a kid took a re-test and did worse, nothing happened. Now, the re-test grade is the new grade for the standard (although some teachers are averaging the two scores.) (4) Unlimited re-takes are gone. Usually, teaches give 1 re-take and that’s it. (5) The 4,3,2,1 system can now have quarter-point intervals, so a 4 point scale is really a 13 point scale. (6) A student is only eligible for a retake if they have completed all of the previous homework BEFORE the assessment is given. Last year, kids were failing the test, then going back and doing the homework in order to become eligible for the re-take. In physics, we have retakes on our tests and quizzes that can go up to a 90% (A-) if they have done all of their HW before the assessment. And if they do worse on the retake, we average the scores. Last year, we only went up to an 85% (B), but if they did worse, there was no penalty. We had to change our policy since kids were doing tons of retakes but the scores were not improving since there wasn’t any reason NOT to do the retake since your grade could only go up. Now, kids study like crazy for the retake because they don’t want an already low grade to go any lower. We do not grade HW for points, but rather, it’s used as an insurance policy in case they need to do a retake. We give them the answers to the HW so they can self-assess. This is working very well. And we can weight assessments according to their difficulty and length (Examples: quizzes are less weight than a test, and an easy lab full of simple observations is worth less than a 3 page lab report full of calculations.) I couldn’t be happier with the way our grading is motivating students to do their best, and the juniors who have had to deal with the craziness of SBG during their fr. and soph. years appreciate the clarity of the traditional grading scale. We asked our students in physics to give us feedback on their SBG experience compared to the traditional system, and nearly all said that they still can’t make sense of SBG especially since different teachers have different ways of implementing the 4,3,2,1 scores. They like the retake policy, but retakes can be done without using SBG. They see SBG as a more arbitrary system than the traditional system where total points on an assessment translates into a final letter grade. The traditional points- based system clearly shows where they missed something and specifically how much a particular mistake has cost them. What they have disliked the most about SBG is the way a new standard, when assessed for the first time late in the semester, can affect their grade so much. Once again, my post has been longer than I had hoped it would be, so I am stopping now. Dan, it sounds like no one in your building really understands the philosophy of SBG or has looked very deeply into how it can be implemented. What you’ve got sounds like some kind of bizarre and particularly ineffective hybrid of traditional grading and SBG. No wonder you’re frustrated. The fact that you think of SBG as “craziness” and the traditional grading system as having “clarity” and that you believe SBG is “arbitrary” while you think the points-based system “clearly shows where they have missed something” indicates immediately to me a fundamental misunderstanding of what SBG is all about. This is 180 degrees backwards from the way my students, colleagues and I feel about the two. Dave, this is not about asking a student to develop an understanding, this is about forcing a student to reach a rather high standard or else. I’ve never seen my student work this hard as last year, he decided not to play high school soccer again although he had a spot in the varsity team, spending hours at his desk and in tutorial instead. He oftentimes was very close to meeting the standard, his teacher nonetheless decided to grade it as “approaching” rather then “meeting”- and called this “motivation”. Meeting standard is “B”, approaching standard is “F”, there is nothing in between. More then one third of his class either went to summer school or retook the class. His other grades were A and B only, including AP classes. My daughter has a talent for math and faired much better under this system, but she also reported about class mates just giving up on math and extreme cheating during re-assessments. There are long lines for re-assessments and parent volunteers told me they are stretching their numbers to accommodate this and they are only too glad it is only the math department using this system. Do not get me wrong, I am all for academics and learning and actually like the idea of setting standards. But out there in the real world GPA is everything, a student who receives an “F” because he/she is unable to reach an A or B in 50% of the Learning Targets competes with a student at a traditional school who gets a “D” just for showing up in class. There must be a better way to set standards and grade based on them . K -12 is about education and encouraging students to stretch themselves by trying harder classes. The way SBG is done at our school translates into actively denying students to do just that. A student, who would receive at least a C under any other grading system, is failing the class for not meeting enough standards under SBA and is therefore considered unworthy of further education in this field. Instead he/she is forced into the only other class left available for him/her, which is way under his academic level. This system, at least as practiced at our school, fails the average student, sorry. Dave, actually, I do know why we were told to fix the grading system. It was because our school didn’t meet AYP. To be more specific, our African American students didn’t meet AYP, so the principal had to change something, and the buzz in the education world is SBG, so we tried it, and guess what? Our AA students still didn’t meet AYP. Hmmmm. Imagine that! The grading system was not the reason that some students out performed others. Homework not counting as a grade, re-take opportunities given, a lowering of the grading scale to make 50% passing or “approaching standards” still didn’t help those that wouldn’t or couldn’t help themselves. But some kids learned how to play the new grading system and they didn’t put in any effort until they flunked a test. Then they would re-take everything over and over until they memorized the answers on the test but never really “mastered it”, or they had teachers who were lazy (or exhausted) and gave such similar tests to the original that the questions were just rearranged or a couple of numbers in a math problem switched around. Were these the students that needed the system changed for them to succeed? No! These were the A and B students to begin with. So our changing of the grading system did nothing to improve the performance of those for which the system was put in place. How sadly ironic. Why don’t they use SBG to assess student understanding of topics for the teacher’s reflection? They could still maintain the traditional grading system using FCI (Force Concept Inventory) assessment to communicate a student’s performance. Hi Frank, I’m planning on implementing SBG Lite next year, and I have a quick question for you: do you like ActiveGrade? I’ve been using MasteryConnect this year, and I don’t really like it. I use ActiveGrade and have found it very useful. Allow yourself the learning curve, then appreciate what it offers for data storage and visualization and how clearly it can communicate with students and parents. It’s $60/year well spent for me. if anyone is using sbg with AP please let me know! thanks! When you say five standards per unit, do you mean five standards for Chemistry subject? or five standards for say, Elements? And what does your report card look like? Does it only have Chemistry or several standards under Chemistry? – I use a 4-point scale to represent “beginner”, “developing”, “on target”, and “beyond target”, with my middle-school science students. Using the 4 levels seems very, very important to allow for normal variation in what students bring to the situation. – My choice of words/ideas that correlate with the numbers is also very intentional (& changes with student input, from year to year) to maintain a focus on progress, optimism and hope, and to emphasize that learning anything new often requires beginning with no previous knowledge or skill. -Bart: I tried to use SBG with an IB course 2 years ago but rapidly gave up, as the IB course was new to me and I wasn’t ready. Having now finished one IB cohort, I’m ready to try again this year (the IBO provides the necessary descriptors)… I don’t know if the A.P. organization has descriptors that can be used by you to create your own standards for your AP course… that’s what I’m doing with my IB course. …The ‘content knowledge’ is only one of the IB descriptors used. I have not yet mapped the IB’s ‘Understandings’ to standards but that is what I’ll do to make this work with SGB, in addition to paying attention to the non-‘content knowledge’ aspects of the grade descriptors in the IB. – Perhaps strangely – but it works for me – I only have 12 ‘skills’ that I assess through the year in middle school and only one of them is ‘knowledge’. The others are evenly divided into ‘science skills’ and ‘student skills’, with very discrete descriptors for determining a student’s performance in any one. My school’s M.S. program is focused on attitude and skills, and there are no knowledge-focused standardized tests I’m preparing for, just skills-based standardized tests. …Having tracked how the resulting SBG grades of my students relate to ‘traditional point-based grades’, I’ve found a relatively close correlation between the two. The big difference for me and my students is that I/we can talk about ‘progress’, ‘learning’ and ‘standards’ rather than ‘points’. That’s why I’ve moved to SBG. – Often, on an assessment piece (whether formative or summative), I assess more than one of my SBG ‘skills’ for a given question/problem, e.g. ‘knowledge’ and ‘clear communication’ and ‘data representation’. One single question can be very rich in information. …On a given assessment piece, I average all the the individual marks for each ‘skill’. The overall grade for the piece (in a form that the rest of the school will understand) is converted by adding up the various ‘skill’ marks for the total mark (works fairly easily in our 20-pt system, from my 4-pt SBG system). – Students have been asked to graph their averages, and to add range bars, on a tracking sheet. We discuss ‘range’ and ‘reliability’, making connections to scientific knowledge and to error and discuss frankly the impact of sample size. It’s a nice connection between their personal grade and what I hope they’ll learn about scientific knowledge. – Becoming comfortable with making ‘judgement calls’ about a student’s assessment number has been an ongoing challenge as I’ve moved into this SBG world of assessment (having previously used the 100% approach in the US, and also used a 20-pt system as is standard in France). I’ve used a number of different approaches, and appreciate the ‘keep it simple’ mantra of the original author of this post (thanks for the reminder!!). – When I collect enough information, and students have enough opportunities to show me what they can do, they (and I) feel comfortable enough with the system to work with it. As scientists, we all know that ‘error’ is impossible to eliminate, so I do my best to be honest & open, to look for evidence FOR the standard, and trust that working toward success openly with the students will help to overcome the inherent imperfection in any grading system. Written comments on report cards help.